Our hammocks are made from high quality blizzard and anti-pill fleece fabric. Each hammock is hand made in Washington. Grommets are installed in each corner for easy hanging. Hammocks can be tossed in the washing machine and dried in the dryer. We recommend keeping a spare hammock on hand to switch out with the one being washed. SIZES: Our 'standard' hammocks range in size from 14" to 15" square, depending upon the position and orientation of the repeating design pattern printed on the fleece fabric. This is a comfortable size for a single chinchilla, but larger sizes work equally well if you have the space available. We offer 'large' hammocks in approximate sizes: 16” x 16” or 15” x 21". These can be used for single or multiple chinchillas who enjoy cuddling together. We also offer custom made hammocks should you desire a size or print you do not see in our selection. Picture above of a hammock suspended using the 'complete hanger set'. Fur Catcher: One nice feature of the fleece is it attracts shedding fur as your chinchilla reclines on it or runs underneath it. Fur is easily removed with a brush or lint roller. 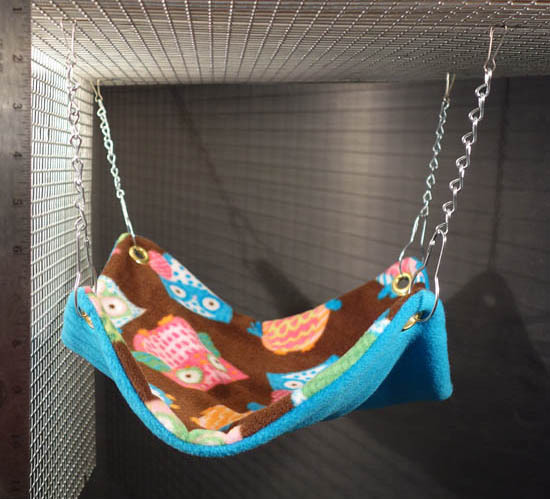 Fall Protection: Hammocks provide some protection against falls when hung across open areas of your cage where there is a clear drop to the cage floor. Miscellaneous: We can also make a variety of soft pads that go on the floors of houses. These can be constructed out of fleece, cotton or flannel with quilted batting sewn inside the flannel and cotton ones for cushiness. Fleece liners for cage bottoms are also available upon request. Hammock Hangers: We offer simple, flexible methods to hang hammocks. Chrome shower ring hooks easily slip through the corner grommets. 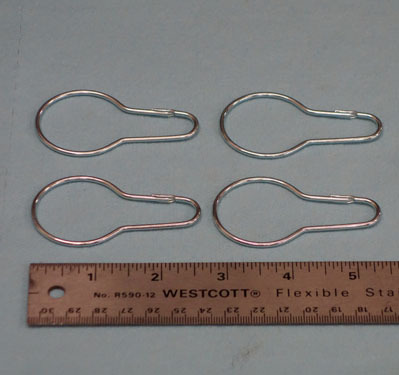 These can be affixed to lengths of ‘Jack chain’ or Lanyard hooks. 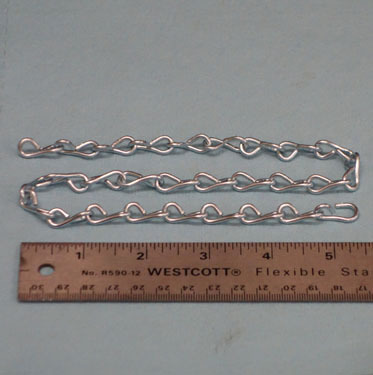 Lanyard hooks then connect the shower rings or jack chain to the cage wire walls‘. 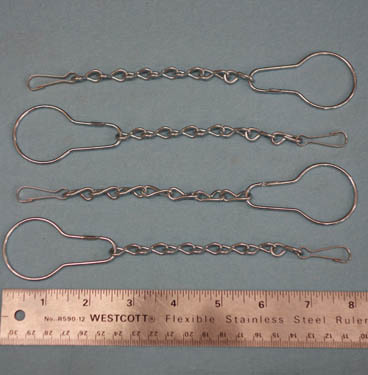 Picture above shows a 'complete hanger set': 4 shower rings, 4 lanyard hooks and 4 x 7 link pieces of jack chain. from ceilings. 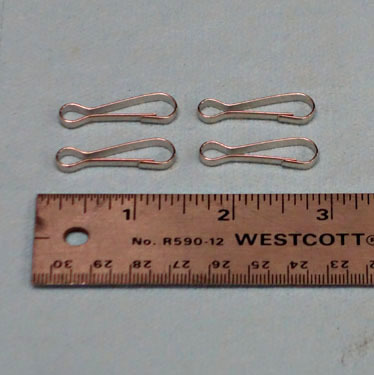 We sell it in 7 and 28 link lengths.